This is an archived version of CCC's website. Please visit the new ccc website for the latest information. 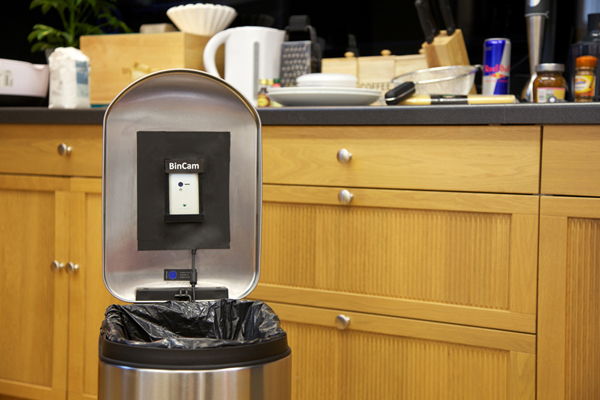 BinCam is a two-part personal informatics system designed to increase individuals's awareness of their food waste and recycling behaviour. It uses a standard kitchen bin augmented with a mobile phone to automatically capture and log an individual's waste management activity. Photos are tagged using Amazon Mechanical Turk and uploaded to the BinCam application on Facebook, which encourages playful engagement and reflection upon a user's personal bin data. People can review and share communications about the bin-related behaviour of themselves and others. BinCam is a collaborative research project between the Digital Interaction group in Culture Lab at Newcastle University, LiSC at the University of Lincoln and the University of Duisburg Essen. Computing Research Highlight of the Week is a service of the Computing Community Consortium and the Computing Research Association designed to highlight some of the exciting and important recent research results in the computing fields. Each week a new highlight is chosen by CRA and CCC staff and volunteers from submissions from the computing community. Want your research featured? Submit it!.